Looking for inspiration for prom, homecoming, or your next formal event? Emily from @emshairdiary had collected 20 of her favorite braided prom hairstyles just for you (all styles were created by her!). Plus, she’ll be sharing some tips, tricks, and how-tos to make sure you can create a hairstyle as stunning as the gown you’ll be wearing. Whether you’re looking for an elegant updo or a carefree downdo, she’s got you covered! Ready for inspiring pics and useful tips? This list of prom hairstyles will help you choose one elegant updo you’ll fall in love with! Then, braid a french braid down to just below your ears and pin it in place. To get extra texture, gently pull small sections of the french braid to loosen it. Pin the remaining curls up into a low, curly bun. Start a dutch fishtail braid right behind your ear and braid up across the top of your head and all away around to the other side. Pin any extra braid underneath the top braid to create a seamless circle. 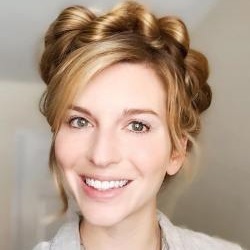 The trick to get the nice volume for this style is to use bobby pins in a line all the way around the braid and then to pull the braid to loosen it. Pull out a few strands around the front and sides for a truly fairy-tale vibe. Since some formal dresses are very clean-cut, it can be nice to contrast that with a messy braid for prom. Interesting braids shouldn’t be limited to the festival grounds — this center dutch braid going into a messy fishtail will be a standout style on the dance floor. Pair this braid style with a black dress and statement piece of jewelry. Separate your hair into three sections down the back of your head. Braid each section into a rope braid, and gently pull on each section of the rope braid to loosen it. Then, bobby pin the rope braids in place in the back to keep them together. Take the ends of the rope braids and loosely braid them together and secure the ends with an elastic. Braid a dutch lace braid across the sides and front of your hair, and braid a regular three-strand braid with the remaining hair. Then, tuck the end of the braid under the start of the braid. This style would be lovely with a flowy gown. These romantic twists are a unique take on the classic curly updo. This style is created from stacked topsy tails pinned up into a bun, with a rope braid accent. An updo like this is a great choice if you have dress with beautiful detailing on the back. It will allow people to admire your hairstyle, without it interfering with your dress style! Want to know a secret? This dreamy updo is simply an extremely pulled-out french braid! The trick to taking your french braid from weekday to whimsical is to start with lots of texture. For the base of this style, curl your hair and add hairspray for hold. Then, tease the top of the hair for volume. Next, create a loose dutch braid down the back of your hair and secure with an elastic. Starting from the top section of the braid, pull out the braid as far as you can and then pin it in place. Repeat this all the way down the braid and then remove the elastic and pin the remaining hair up and under the pulled-out braid. Asymmetrical styles are a great pairing with asymmetrical dresses. If you have your eye on a one-strap dress, complement it with a side hairstyle like this dutch french braid and low bun. Place the braid on the same side as the strap and the low bun on the strapless side to add balance to your look. Have a dress that’s stunning, but simple? Add detail with your upstyle. An easy way to add visual interest to a braided style is to create a combo braid. This style is a combination of a rope braid, an infinity braid, and a bubble ponytail. Tip: Wrap a small piece of hair around each elastic you use and pin it in place to add an extra layer of detail. Who says a high bun has to be preppy? If you’re looking for prom hair with some added edge, try this braided part bun. Begin by sectioning out a half-inch section of hair along a side part line. Starting from the back of your head, braid that section into a small dutch braid going toward your face, and continue braiding to the end of your hair. Tuck this braid behind your ear and bobby pin it in place. Finally, create a high bun to complete the look. Braids can be the main star of your hairstyle, or they can play a supporting role. This low, curly bun is transformed into an elegant braided hairstyle by simply adding a few accent braids to the sides of the style. If you’re seeking a classic style to go with a formal gown, this choice is charming. Dance the night away without your hair getting in the way (and still look fabulous)! Fancify your ponytail by adding a rope braid to the top of your hair. Wrap a small piece of hair around your hair tie to finish the look. Tip: You can tease your ponytail to give it some extra volume. Sometimes less is more. This boho part braid is all you need to take your hairstyle up a notch, and it would look fantastic with a flowy, pastel dress. Separate out a half-inch section of hair along where you would part your hair to the side. Next, starting from the back of your head, braid a small dutch braid from the back to the front and secure the end of the braid with an elastic. Then, fan out the braid by pulling on each section of the braid. Pull the braid across your forehead and pin it behind your ear. If you like prom plait hairstyles, but you want to shy away from commonly used braids, try adding an infinity braid to your look! Infinity braids are made by wrapping a small piece of hair in an infinity pattern around two strands of hair; once you get down the pattern, they aren’t difficult to learn. This style combines a topsy tail, an infinity braid, and a low bun for a tousled, fanciful look. Combo braids for the win! Add a unique twist to a dutch fishtail braid by “interrupting” it with a small infinity braid in the middle and at the end of the braid. (You can hide a clear elastic hair tie after the first infinity braid to keep the style extra secure). This standout updo would mix well with a high-neck, low-back dress. Then, lightly tease the top middle section of your hair from the front of your head to the crown of your head. Take the section you teased and braid a french braid back to the crown of your head, and then continue braiding a regular braid for five or six inches and secure with a clear elastic. Fan out the braid, starting from the bottom to give it extra volume and texture. Want a carefree look, but with some extra style? Elevate some boho waves with small accent braids. I recommend an infinity braid or a triple infinity braid, if you really want to up your braid game. This breezy style would look enchanting with a white lace dress. Braid your hair into a dutch fishtail braid and secure the end with a hair tie. Grab a small piece of hair from underneath the hair tie and pull it taut and hold firmly. Next, pinch the hair tie with the other hand and then slide the hair tie up the piece of hair you’re holding until the braid is scrunched up as high as it will go. Then, take the end of the braid and pin it into a low bun. If you’re looking for loose braided prom hairstyles for long hair, this messy mermaid braid is a fantastic way to style your long locks. This style is made from two pulled-out french braids stacked together. Tip: To get the loose, messy look on the bottom braid, start braiding a french braid, but for each new section, only incorporate hair from the outer part of your hair instead of incorporating the whole section of the hair into the braid. This allows you to continue a french braiding technique beyond the nape of the neck. Make a regular three-strand braid. Then, pull out the sections on only one side of the braid — these are the rose “petals”. Starting from the end of the braid, roll the braid into a tight, flat circle with the petals on the outside of the circle. (The end of the braid will form the center of the rosette). Once you have rolled the hair as much as you can, pin it flat to your head with several bobby pins. Want more hair inspiration? Follow @emshairdiary on Instagram! From formal looks to everyday hairdos, she shares the new styles she tries and the tips and tricks she picks up along the way.